Common Man’s Party is hijacked! Aam Aadmi or Common Man is not a new word in politics in India. Another synonym of common man is Janta which is the prefix or suffix of name of every second political party. But it was the branding of word ‘common man’ that attracted voters and its Govt swung into power in Delhi. But within a year the very word ‘Kejri’ has become a dirty word on the street, as I had summarised earlier in Kejri Effect. But that was about the outrageously false promises made by Aam Aadmi Party (AAP hereafter). It actually bribed the voters by promising a number of freebies to vote for it while its main plank was to make politics in India corruption free. AAP is second biggest failure of this century but it can still redeem itself. It has four more years to remain in power in Delhi. If it works for the benefit of people it may redeem but if it will work for the ambition to come into power all over India, it won’t be able to do either. AAP is second failure of century because the first was UPA-2 Govt i.e previous government of India which was voted to power in 2009. Remember how election result boosted the stock markets by several hundred points in a few minutes and circuit breakers closed the trade twice at every rise of 5%. It happened twice in same day. Serious reforms were promised by UPA-2. But that Congress led Government did not deliver and was severely punished in 2014. Once it came to power, it threw its internal ombudsman out of office without any notice or opportunity of hearing. It also threw out two founding members who were considered as threat to CM Arvind Kejriwal who is now face and soul of party. Soon the façade of party with the difference was over and we were confronting another ambitious politician running a political party from the top like a ruling monarch. The agenda of a party of common man is already over and party stands hijacked to become personal fiefdom of Arvind Kejriwal. There is nothing wrong in a party promising something to a section of people but there can be nothing worse by inciting one section and at the same time ignoring wrong doing os another section. Worse is secret parley with non political sectional leaders, religious or other wise. Arvind Kejriwal did everything. What was expected was that with educated non politicians coming into fray, Delhi will usher into issue based politics. Alas! Kejriwal brought out Bihar out of Delhi which we never knew had existed. Parley with auto drivers and ignoring the way they fleece passengers by exorbitant and illegal fares. Siding with Muslim imams and delivering rhetorical speeches was beginning. After election Arvind did not hesitate to show alliance with those convicted will corruption. He publicly stood with those accused of rioting. Embraced the person who publicly sided with terrorists. The list is expanding everyday. 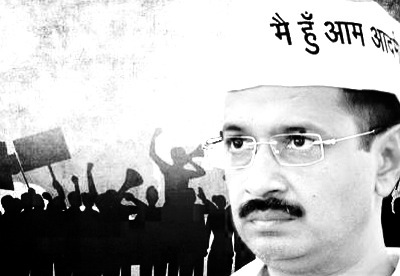 Arvind Kejriwal seems to have no scruples or boundaries for his political ambition. Noisy as politics in India is, decency is the last thing these days. But Kejriwal has and is stooping to new lows every day. He is hurling expletives like ‘Psychopath’, ‘coward’ & ‘ISI Agent’ on Prime Minister Modi who chose to ignore him. Before election when he was asked about Pakistan, he refused to answer by deflecting that it is not related to Delhi Elections but now he is questioning foreign policy of the country in respect of Pakistan by holding press conference. Due to such flip-flops, Kejriwal is in a unenvious position on twitter where he is most trolled person and most tagged in photographs. As a sitting Chief Minister joining traders in their protest against levy of excise duty is another instance of his indecency and craving for publicity. In the books of Kejriwal there is only publicity and no such thing as bad publicity. I wonder how long it will take for him to take off his clothes in front of camera only to remain in news. Wakeup, dream would be soon over. Power comes with responsibility. But all Kejriwal can boast is that he increased the salaries of his MLAs by a whopping 400%. Rest is business as usual. Bureaucrats are running the show as no new policy direction is issued. Infact the Ministers interference with their work is such that many have requested for a transfer out of Delhi Government. People of Delhi is cursing themselves. Businessmen having dealing with Delhi Governments are not unhappy. That is real surprise. They say it is business as usual which is a euphemism for usual corruption. Not a single corrupt official has been caught or prosecuted but Aam Aadmi Party has proclaimed the Delhi to be corruption free. It makes me wonder if Kejriwal thinks that the people who voted for him are imbecile if not idiots and believe his rhetoric rather than ground reality. But Kejriwal is so aloof in his ivory tower that the whispers of the people admitting their blunder will not reach him. He can still wake up but intoxicating as the power is, chances are slim. This entry was posted in Politics and tagged Aam Aadmi Party, AAP, Arvind Kejriwal, Delhi Government, Inner Party Demoracy. Bookmark the permalink.